Get off the interstate! Y'all are missing all the good stuff! Remember how I said that I was disappointed in how Texas has failed to maintain much of our Rt66 history and landmarks? 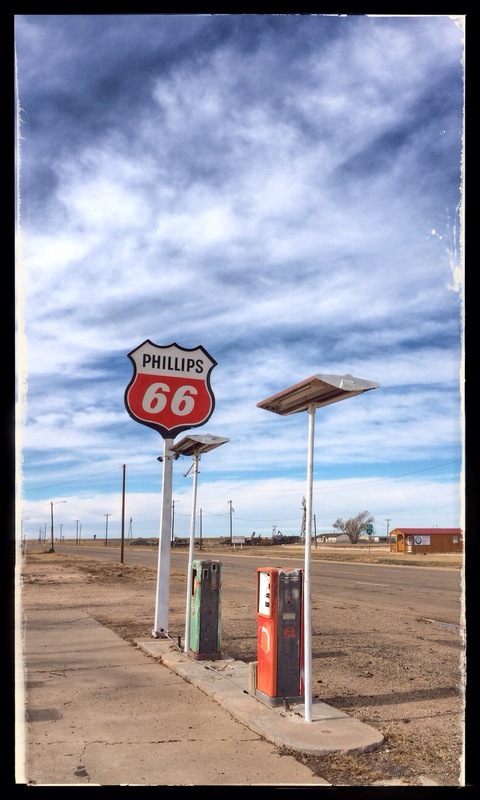 (See post “Preface to Route 66.) 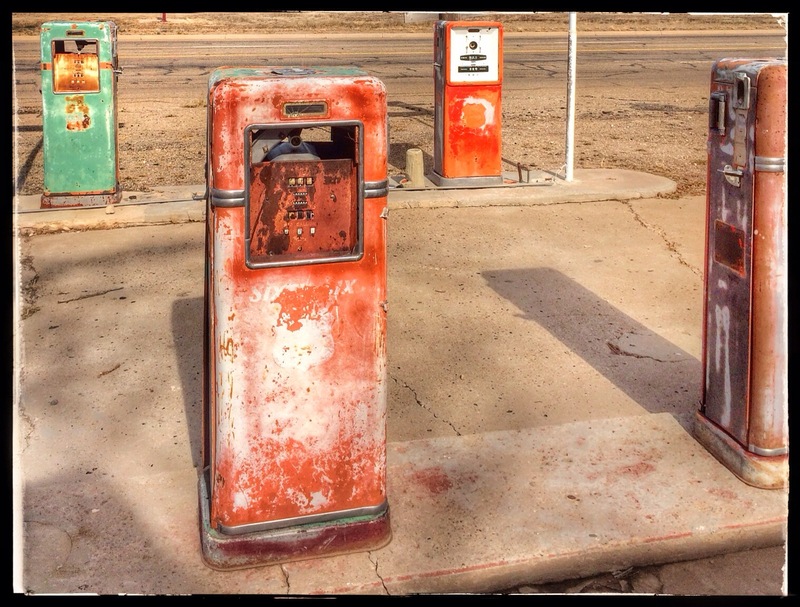 Here’s what I meant: Among the disappointments on our Rt66 journey was our trip west of Amarillo to the towns of Adrian and Vega. Adrian is also known as “Midway” or “Midpoint” because it is EXACTLY half-way between Chicago and Los Angeles on Rt66–1,139 miles to either. 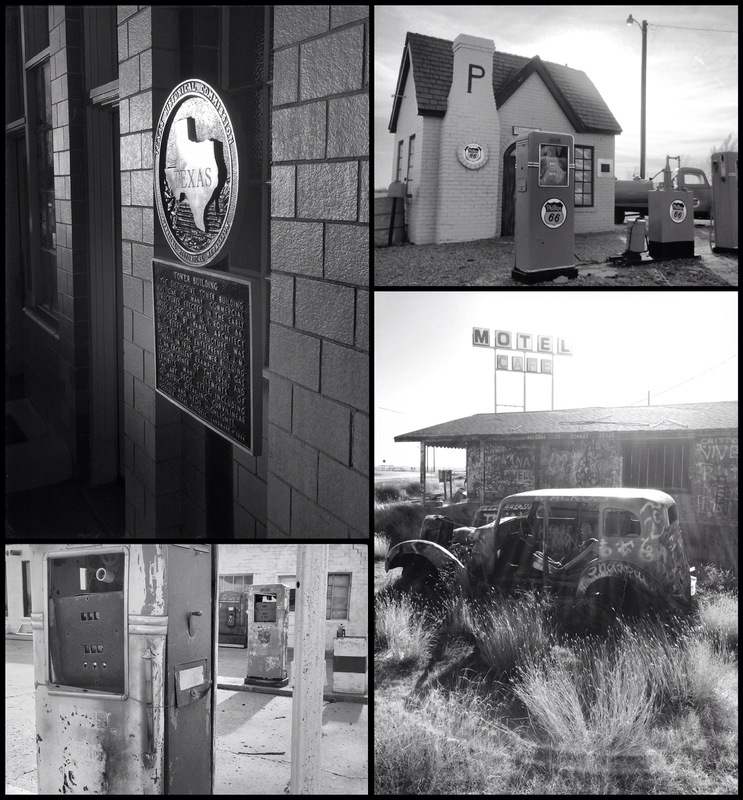 And, we were excited to learn that the inspiration behind Flo’s V8 Cafe in the Pixar movie “Cars,” had been none other than the Midpoint Cafe in Adrian, Texas! We knew the cafe itself didn’t look like Flo’s but we’d heard that the owner and the inside were pretty awesome. Rt66 memorabilia was on display in the 1950s-esque diner, and the owner was reportedly the inspiration for FLO HERSELF! “Cars” fans in the backseat rejoiced in excitement! After leaving Cadillac Ranch, we went west, first to Vega. 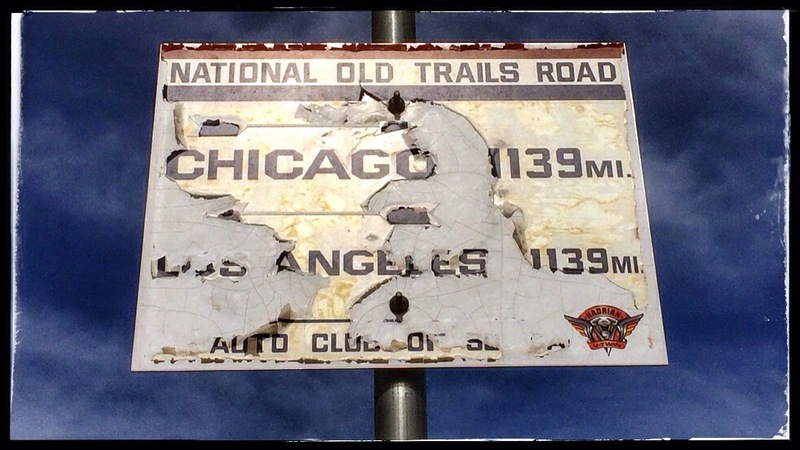 We saw some of the old neon signs– which, we learned, is what mostly remains of the Mother Road. We parked at the Courthouse and used their facilities to try to scrub the spray paint off the kiddos. No dice. My boys were blue. The paint wasn’t coming off. So we checked out the old restored Magnolia Station (pretty cool) and then headed across the street to Roark Hardware. Of all the places we stopped on our trip, Roark Hardware has got to be filled with some of the nicest people we’ve met. Not only did we want to see the oldest operating hardware store on America’s Main Street, but we needed help getting the paint off the boys. The shop was pretty neat. Filled with modern hardware items as well as some cool vintage stuff on display, Roark’s looked a lot like an old-time general store. Everyone jumped in on helping us find a way to un-paint the boys, and when we wanted to BUY the supplies, they were surprised that we didn’t just want to use some! We insisted, and left with clean kids and a happy feeling because we LOVE supporting small business. However, our joy was short-lived. Everything else in Vega was closed! 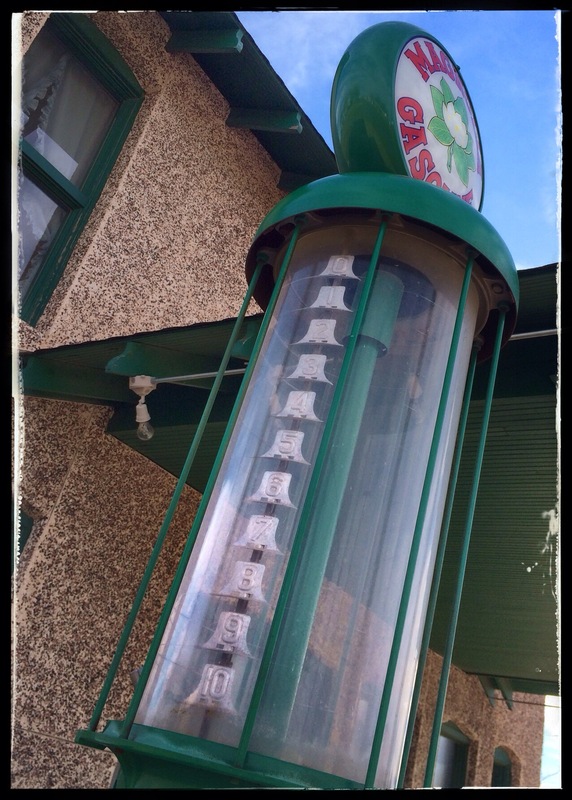 Every Rt66 attraction we’d read about, every place our new friends at Roark’s recommended, everything on Trip Advisor and Yelp and our Rt66 app…. Closed. We passed up the restaurants because, well, the Midpoint Cafe was just a few miles down Rt66. So, we took some pictures around the Magnolia Station, and made our way west to Flo’s. I mean The Midpoint Cafe. However, we did take a little “scenic” drive through the town of Adrian, and saw some hilariously strange road signs. Since they were mostly in people’s front yards (and residents looked at us like we were nuts for cruising through the residential area) I didn’t snap any pics with my Professional Fancy Candy Apple Red Picture-Making Magic Box (or the iCheese). But now I regret it because NOW I know these were some of Stanley Marsh 3’s bizarre road signs, erected in tribute to the eccentric millionaire when he died this past June. HINDSIGHT PEOPLE!!! DO YOUR RESEARCH!!! I SHOULD’VE BEEN PREPARED! And, well, I did enjoy the Bent Door Trading Post, even though it was closed. 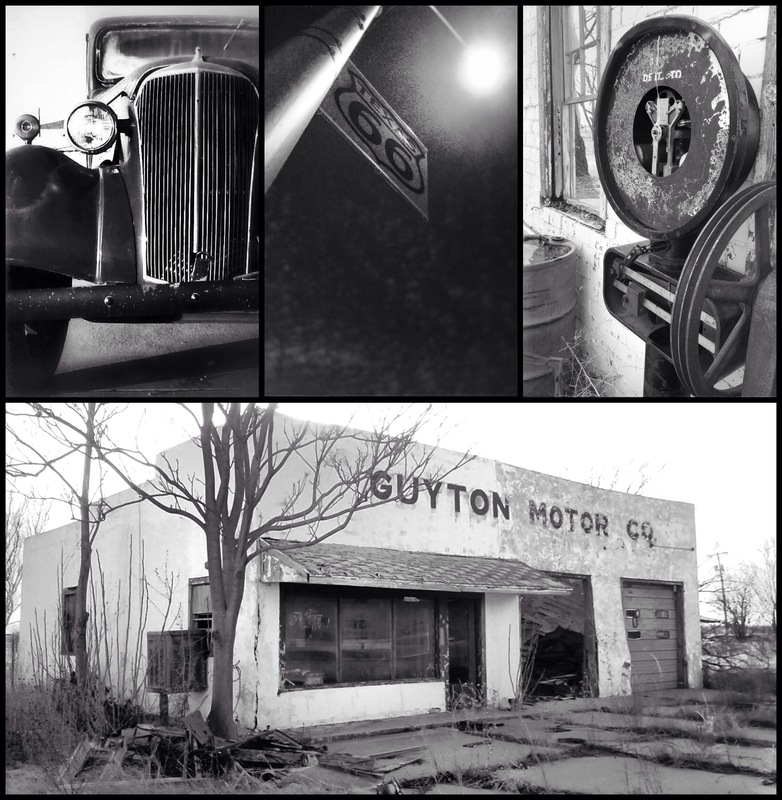 I jumped out and took some pictures (and poked around, like I love to do in old, broken down, scary-looking, dilapidated, ghost-town looking buildings). 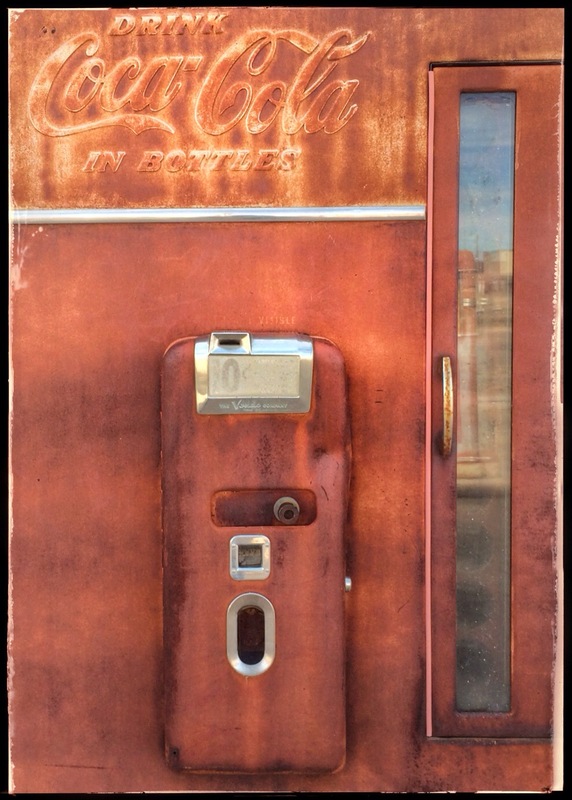 There was some interesting “rusty gold” as Mike and Frank on American Pickers say, and the gas station fixtures out front were pretty neat. 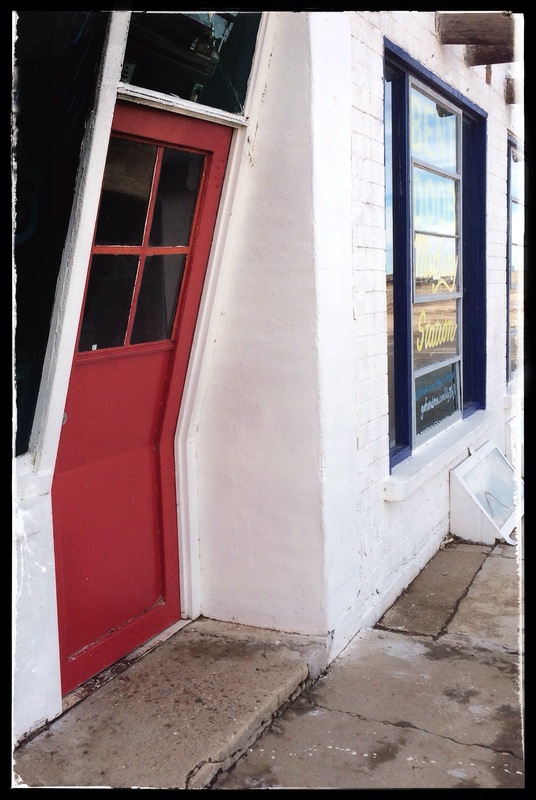 Not to mention the cool front door, which is, in fact, “bent,” as the name implies. It was originally a cafe, souvenir shop, and gas station. Built in 1947 by Robert Harris, it was actually called “Midway Station,” but everyone just called it the Bent Door Cafe” because the recycled doors and windows from a WWII USAF watch tower were “bent.” In 2009, the name was officially changed to “The Bent Door.” It had been saved from demolition, and I’d read that it was in the process of restoration, but, unfortunately, I could see no trace of this when we were there. Sad. Unable to take any more disappointment, we turned the SSPhelps around and did what the Crazy Train does best….. We implemented PLAN B! The kids were STARVING (my sarcastic emphasis because apparently, the all-you-can-eat free waffles at the hotel couldn’t have sustained them for another half hour so we could see the TX/NM border) so we turned around and headed back to Amarillo, sights set on the infamous cheeseburgers of the Golden Light Cafe– CONFIRMED to be open and ready to flip some burgers! 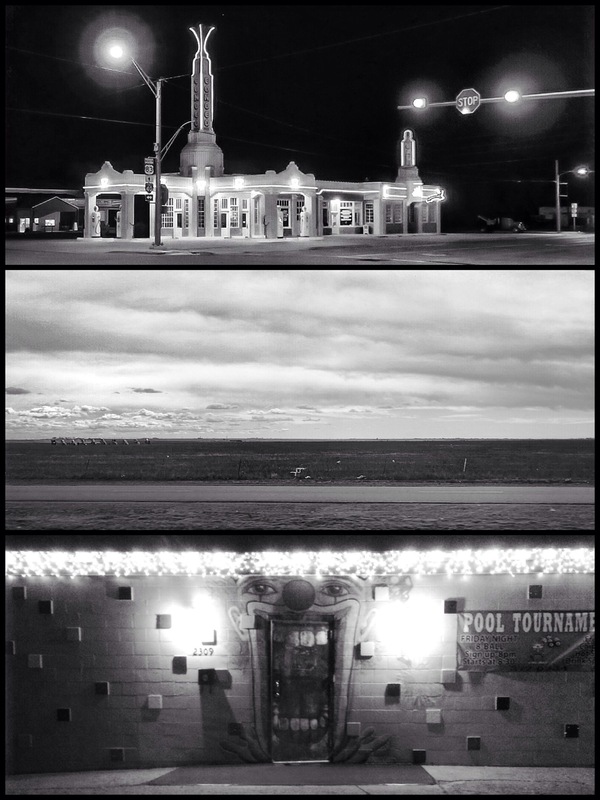 When we decided to go up north to Route 66, I was really, REALLY excited. Not because I’m a history nerd, but, for all y’all who don’t know me, I’ll give you a partial autobiography of the Crazy Train’s navigatrix. To get to the heart of my love of photography, you don’t go back to my roots–I started too young for that. You can’t really even go back to the first years where I started to explore in photography. 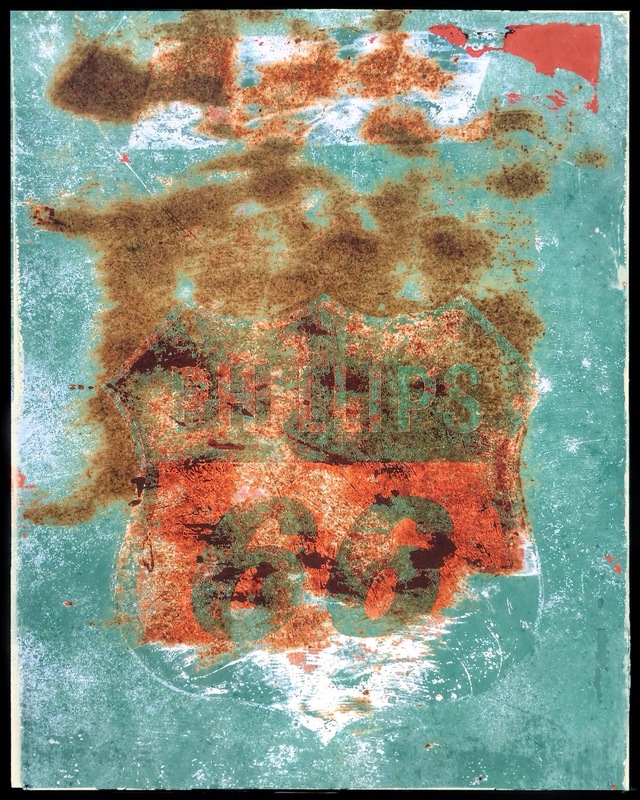 But if you go back to college where I first learned about the specific artistic movement that would grab me and bring out the artist deep within me, then you see why the idea of Route 66 was so exciting. It was during my studies in photocomm at St Ed’s that I first learned about the art of documentary photography and the photographers of the Farm Securities Administration (FSA). It was from my professor, photographer Sybil Miller, that I learned how photography, quite literally, changed America. The (FSA) was created in 1937 (an evolution of the Resettlement Administration) in the US Department of Agriculture as a part of FDR’s New Deal. From 1937-1944, the FSA became famous for its small, but highly influential, photography program. Economist Roy Stryker headed up the Information Division of the FSA and launched the documentary photography movement. Though not a photographer himself, Stryker understood the power of the photograph and promoted the camera as a tool to document society. In an age before digital manipulation, TV, and the 24-hour news cycle, a photograph provided solid proof of the conditions and the details in which so many Americans lived. Stryker had a knack for attracting top-notch photographers and for getting the best work from each one. He sent them into the field fully prepared for what they would encounter, and they all knew that an educated, sensitive, understanding, and compassionate photographer could effectively transfer the feelings and emotions of an otherwise silent portion of our population onto film, and in doing so, could cogently share those feelings with the rest of the nation. He was responsible for launching the careers of some of the most gifted and influential photographers in American history. Walker Evans, Dorothea Lange, Gordon Parks, Russell Lee, Arthur Rothstein…. FDR’s Brains Trust underestimated these photographers’ ability to produce images that breathed life and emotion and art and empathy and truth into the era. The eleven photographers who worked on the project took on this task of “introducing America to Americans,” and produced approximately 250,000 images– half of which still survive today in the Library of Congress. It wasn’t until these photographs were introduced to the nation that America really understood the depth of the Dust Bowl, the Depression, and the plight of the American migrant farmer. So, let’s put two and two together. 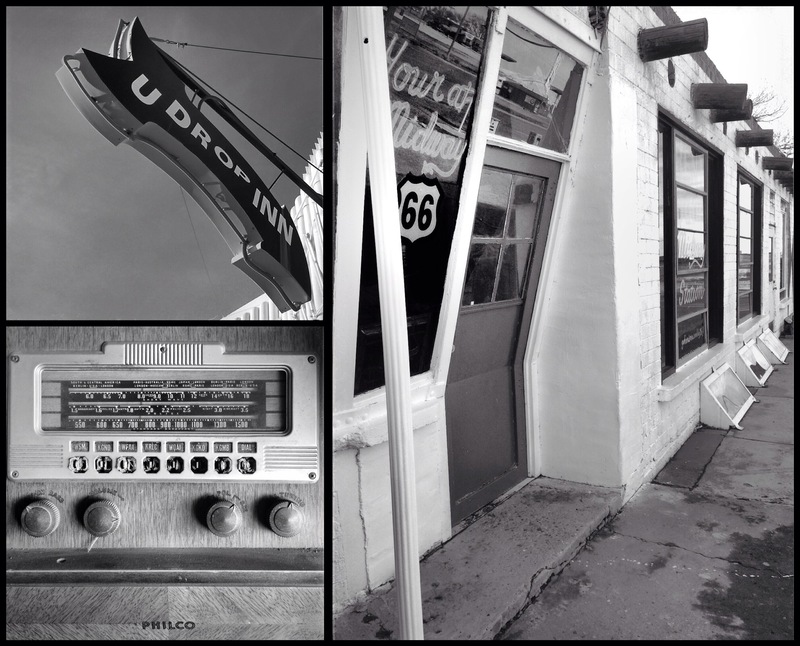 Old Route 66 appealed to me, not just because I’m a history nerd, but because I wanted to walk in the footsteps of some of my favorite photographers–the very men and women who have influenced my vision for the last 20+ years. I wanted to see the places they visited and photograph some of the places they photographed. But, time marches on, and, to my disappointment, it has trampled all over Old Route 66 like a steamroller over a flowerbed. Texas is usually wonderful about preserving our historical places, but this was not true for the 178 miles of Texas’ portion of “The Main Street of America,” the road taken by hundreds of thousands of Americans during the 1930s. This legendary road that follows the path of Native Americans, conquistadors, cattle and oil barons, cowboys, and Dust Bowl refugees has been replaced by US40, and is mostly unmarked (as Rt66). 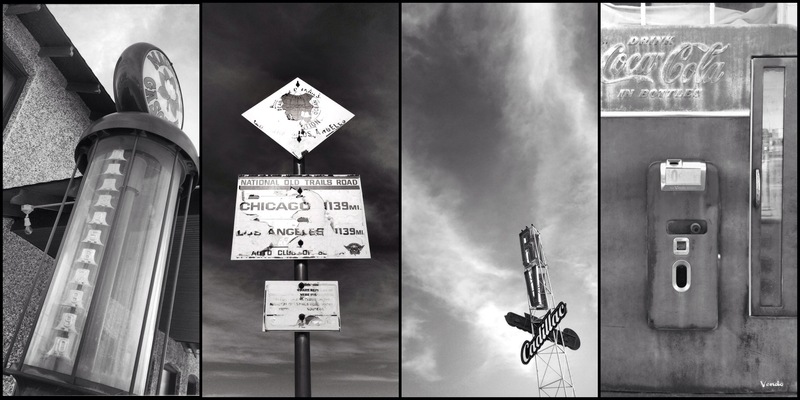 The iconic signs are gone, both from the road and from many of the places that made it famous. 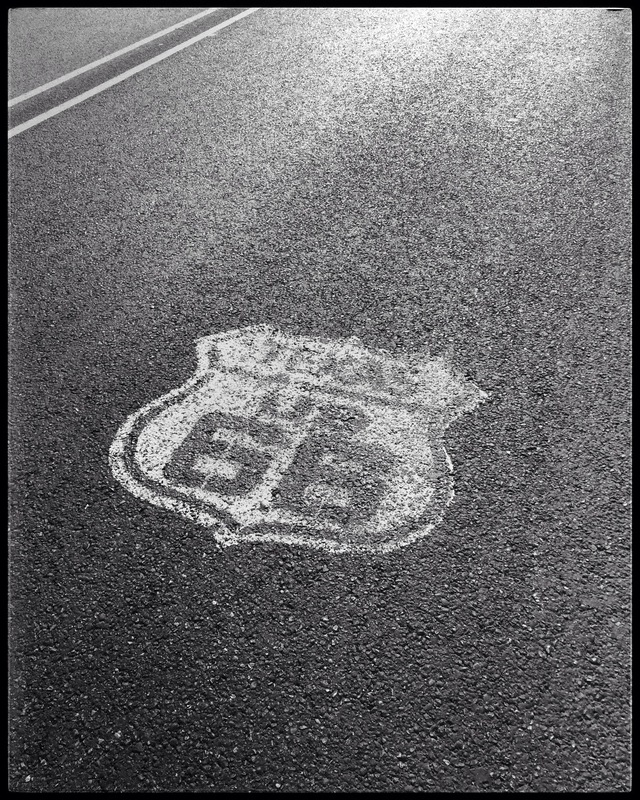 (Route 66 is the ONLY National Highway to be decommissioned from the original 1926 grid created by the US Highway System. Shameful.) The landmarks have all but disappeared. And, without a doubt, our stretch of The Mother Road will disappear into myth and lore, replaced by something newer, something better, and sometimes, by nothing at all.